There has been a flurry of negative news about the health of the European Union. It seems like everything that could possibly go wrong has done so. The outlook is so bad, some economists are talking about the eventual demise of the European Union. Angela Merkel, German chancellor, told Parliament in Berlin that the Eurozone crisis was the greatest test for the European Union since its creation. “It is a question of survival,” she said. “The euro is in danger. If the euro fails, then Europe fails. 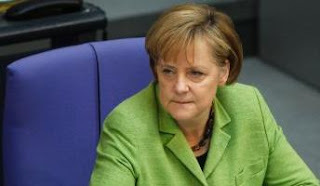 If we succeed, Europe will be stronger,” said Merkel. Mario Draghi, the head of the Bank of Italy who chairs the Financial Stability Board coordinating international regulatory reform, appealed for countries not to abandon a joint approach. “At this critical moment it is vital that we continue to work together on reforming the international financial system and maintain our faith in international cooperation,” he told the Financial Times. The greatest problem facing the EU is one of trust in how the sixteen members of the common currency accumulate sovereign debt. Since there is no control mechanism for what each member spends to fund its government, the organization is based on an honor system - which has been a disaster. EU members are required to keep their budget deficits to around 3 percent. Greece has a deficit of 13 percent of GDP, and there is no indication that it will ever be able to manage its budget. Greece has a proven track record of defaulting on its foreign debt obligations. Greece is a welfare state with some of the most outrageous benefits. A Greek firefighter can retire at the ripe old age of 45. While people riot in other parts of the world for political freedom, the Greeks picket and strike over the right to receive government handouts. Germans, with a proven record of a strong work ethic, are grinding their teeth over having to help subsidize their southern neighbor. Global markets have nosedived over fears that the European debt crisis could lead to a replay of the freezing-up of financial markets we witnessed in 2008. Banks in Europe are afraid to lend money to each other because they don't know what would happen to each other if Greece is forced to default. Europe's banks are probably in far worse shape than American banks before the housing bubble burst. Over here, when someone defaulted on a mortgage, at the least the bank could reclaim a house. German banks, with loans to other nations, have nothing to foreclose on. In March, I said, "The most likely outcome of the Greece debt crisis will be a Band-aid in the form of some kind of loan guarantee from an outside financial organization." This scenario has happened. The EU and the International Monetary Fund joined together to create a trillion-dollar slush fund for Greece and other nations. I also said it won't be enough, and "another crisis is certain to quickly follow." We might get a respite of a few months by kicking the can down the street, but you can't fix the debt problem by giving nations like Greece more credit. We are at a very interesting point in history. The Bible said there would be a reformation of the Roman Empire, and that it would lead to the advent of the Antichrist. It doesn't seem possible for the EU to collapse into ashes. No matter how bad it gets, the union is going to survive. The Bible tells us there will be a final world power that will have an extremely weak power base. In the vision given to Nebuchadnezzar and interpreted by Daniel, it is described as iron mixed with clay - meaning this government will have a connection to the Roman Empire, and it will be highly flawed. Out of this mess will come the most cunning and ruthless dictator the world has ever seen. A partial breakup of the EU might actually benefit the progression of Bible prophecy. Scripture tells us that there will be ten kings who will give their power to the Antichrist. We currently have twenty-seven members of the EU, so something needs to happen to draw the number of leaders down to the magic number. The crisis we see now could be what triggers the final realignment. "And the ten horns which thou sawest are ten kings, which have received no kingdom as yet; but receive power as kings one hour with the beast" (Rev: 17:10). "For God hath put in their hearts to fulfill his will, and to agree, and give their kingdom unto the beast, until the words of God shall be fulfilled" (Rev 17:17).